Click here and go to item 33F. AVAILABLE NOW! 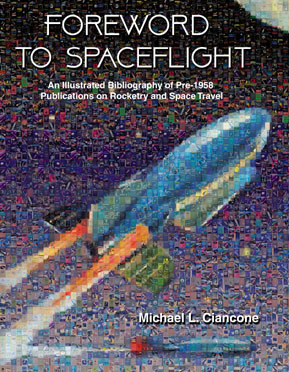 Foreword to Spaceflight provides a long-anticipated update to Michael L. Ciancone’s acclaimed book The Literary Legacy of the Space Age. This update offers a unique resource for book collectors and historians alike through hundreds of annotated entries that identify books published before “Sputnik” on what the author refers to as “speculative non-fiction” related to the use of rockets for spaceflight. It contains entries for titles published in Danish, Dutch, English, French, German, Italian, Norwegian, Spanish, Swedish and Russian. Most notable in this edition is the inclusion of colorful images of the covers of many of the entries. In addition, the author (along with Prof. Asif Siddiqi, the world’s foremost authority on Soviet spaceflight history) has provided a unique Annex of Russian titles published in the former USSR. Includes hundreds of colour photographs of rare early books on astronautics.